Scientists from the Stony Brook University School of Marine and Atmospheric Sciences released the 2017 Assessment of Water Quality Impairments for Long Island, an annual report highlighting prolonged toxic algae blooms and a deficiency of oxygen in Long Island waters caused by high levels of nitrogen. This assessment provides the public and policy makers with a comprehensive view of water quality trends and challenges facing our surface waters. The report identifies the brown tide outbreak, which began in mid-May and continued into August, as notable for multiple reasons: it was very broad, covering waters from Freeport to Southampton; It was also the longest duration harmful algal bloom on Long Island and the most intense, with cell densities exceeding 2.3 million cells per milliliter in the Great South Bay, a level never before recorded on Long Island. Events depicted in the study include blooms of Alexandrium, an alga that causes paralytic shellfish poisoning and shellfish bed closures, rust tides caused by the algae Cochlodinium, brown tides caused by Aureococcus, toxic blue green algae blooms commonly caused by Microcystis, and unusually heavy growth of the green seaweed Ulva. 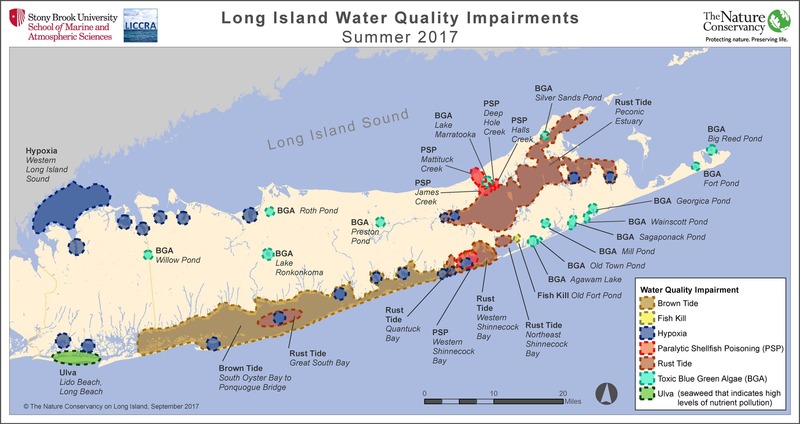 The following map from the report shows all of the 2017 Long Island algal blooms and low oxygen zones. Low oxygen zones were documented in 21 locations, up from five found during a 2013 assessment. View the attachment at the bottom of this email to see a larger version of the map. The report was compiled by Dr. Christopher Gobler, Professor at Stony Brook University, whose laboratory monitored and sampled Long Island’s waters on a weekly basis. Data was also collected from the Long Island Sound Study funded by the U.S. Environmental Protection Agency. The study was funded by the Rauch Foundation through its support of the Long Island Clean Water Partnership (LICWP). Governor Andrew M. Cuomo announced a $10.4 million effort to improve Long Island’s water quality and bolster the economies and resiliency of coastal communities by restoring native shellfish populations. New York State is establishing five new shellfish sanctuaries,which are no-harvest areas that allow shellfish to filter out algae before it becomes a toxic bloom, and to reproduce and rejuvenate shellfish populations. The sanctuaries will be strategically located and managed by SUNY Stony Brook and Cornell Cooperative Extension in partnership with municipalities and volunteer organizations. Suffolk County sanctuaries will include portions of Bellport Bay, Shinnecock Bay and Huntington Harbor. Nassau County sites include parts of Hempstead and South Oyster bays. Up to 179 million shellfish will be grown in Long Island’s hatcheries and seeded in each of the selected waterbodies over the next two years – enough shellfish to filter the water in these areas every three days. Shellfish planted in each of these areas will include a mix of adult and juvenile clams and oysters. The sites will be monitored to assess survival, growth, and reproduction, and to gauge the effort’s success and guide future seeding initiatives. The Governor’s announcement also included funding to allow Long Island’s existing hatcheries to expand their seed production to meet the needs of this ambitious program. For more information, and a video from the announcement, view the Governor’s Press Release. The Suffolk County Department of Health Services Division of Environmental Quality released its Suffolk County Harmful Algal Bloom Action Plan, a comprehensive and integrated strategy developed to guide the work of government, scientists, and academia to address increasingly frequent algae blooms that have plagued marine waters, threatening both Suffolk County’s environment and economy. The top strategic priority in the plan is the reduction of loadings of nitrogen and phosphorous to ground and surface waters through the replacement of non-performing cesspools and septic systems with new Innovative/Alternative Onsite Wastewater Treatment Systems, and the adoption of additional measures to regulate the amount and composition of nitrogen-based fertilizers. In addition, the plan calls for the establishment of a Harmful Algal Bloom Management Workgroup to coordinate plan recommendations, and for significant new investments in water quality monitoring, research and public outreach. The first Innovative/Alternative Onsite Wastewater System (I/A OWTS) was installed under the Suffolk County Septic Improvement Program at a private home in Flanders, New York. The homeowner was able to completely subsidize the installation through grant funding from the County’s program and from the Town of Southampton’s parallel program, which is funded by a portion of the Town’s Community Preservation Fund. Links to technical documents related to harmful algal blooms and bioextraction have been added to the LINAP Technical Resources webpage. The most recently added documents are marked as NEW.